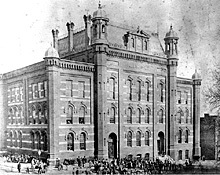 The Franklin School was the flagship building of a group of eight modern urban public school buildings constructed in Washington, D.C. between 1862 and 1875 to house, for the first time, a comprehensive system of universal public education. 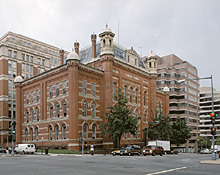 Franklin School served as the laboratory in which Washington’s public school system developed, including new programs such as age-graded curricula, vocational education, high school, and professional training. The offices of the Superintendent and the Board of Trustees (Education) were also housed at Franklin. The building's 19th-century façade - including a bust of Benjamin Franklin - is an eloquent expression of principles of public education for a democracy in post-Civil America. Cluss described its architecture as "modern Renaissance", but it had its origins in the German rounded arch style, known as Rundbogenstil. Its appearance, size (three and a half stories), and hill location all were designed to inspire students, dignify the educational profession, and elevate the public schools to a position of respect. Franklin School's interior included fourteen individual classrooms, all with windows on two sides for natural lighting, cloak rooms for privacy and noise reduction, blackboards on two walls, and a raised teacher's platform with a curved niche to improve teacher-student visibility and communication. The building included innovative central heating and ventilation systems. The massive third-floor Great Hall at Franklin functioned as a community resource for public lectures, musical programs and exhibitions of student work. Originally frescoed in a trompe l’oeil design, this space was an auditorium that seated 1,000 students and was complete with a musician's gallery. Franklin was one of the most prominent buildings in the city. A large clock on the exterior served as the neighborhood's timepiece. Located only a few blocks from the White House, tourists and foreign ambassadors included the school on their tours of the city. Alexander Graham Bell successfully tested his new invention, the "photophone" (sound transmitted by light waves), from the rooftop of Franklin School in 1880. Congressmen sent copies of its plans to their home districts. A model (constructed by Cluss) of the building was sent to expositions in Philadelphia, Vienna, and Paris where it won awards. As city fathers hoped, Franklin attracted the children of the middle class, including the children of presidents Andrew Johnson, James A. Garfield, and Chester A. Arthur. The exterior of Franklin was restored in 1992. The building is on National Register of Historic Places and has been designated a National Historic Landmark. The interior is protected under DC historic preservation laws, but was not restored and remained largely as it was. In 2002, the building was later used as a homeless shelter that eventually closed in 2008. It remained empty again for almost ten years. Thanks to a private donation, it is redeveloped into a museum. The interactive language arts museum and education space, called Planet Word, opens in 2019. For more on the history of Franklin School, its international influence, Cluss's description of the school and his floor plans, photographs and other images, as well as proposals for the building see http://www.franklinschooldc.org/ and https://dc.curbed.com/2017/11/21/16685910/franklin-school-planet-word-opening. Cluss's architecture influenced the nearby neighborhood. On K Street, from Thirteenth to Fifteenth streets, he designed one other school, (66), a five unit row house, (37), other single family residences, (39), (43) and (103), and one duplex (78). Within a block of K Street, he also designed a church (5) on Thirteenth Street, a duplex on Fourteenth Street (102) and a house (80) and a hotel (18) on Fifteenth Street.